Home»China-like Tableware»Motif Design»Gold Splendor LOOKS LIKE REAL!! Gold Plastic Spoons 20ct. Taste is evident in its chic, modern, and stylish design. An upscale plastic gold flatware perfect for wedding receptions. The chic gold sheen gives the cutlery an elegant feel that is perfect for formal dinners, banquets, and dinner parties as well as everyday mealtime, picnics, and informal events. BETTER THAN GOLD FLATWARE: See the close resemblance to real gold flatware in its size, proportions and finish. Great value for the price in addition with its heavy weight and durability. Not to mention the fact they are disposable making the cleaning process less of a hassle. THE FINEST PLASTIC CUTLERY: Feel the quality by the weight of it in your hand. The chic gold finish will outshine any white or clear plastic flatware set elevating your table setting with stunning gold flatware that will complement any party theme. Same as real silverware, these plastic eating utensils are not microwaveable. MAKE YOUR EVENT EXTRA SPECIAL: Host an elegant event impressing friends with lavish silverware or have an intimate family get-together celebrating not having to do the dishes. Gold 9" Plastic Serving Forks, 5ct. 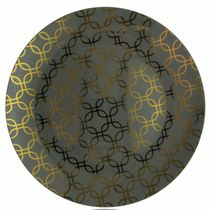 Gold 9"5" Plastic Cake Lifter, 5 ct.
Motif Design 10.25" Gray w/Gold Geometric Overlay Plastic Dinner Plates, 10ct. 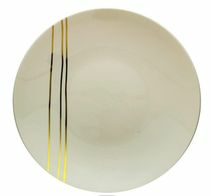 Motif Design 8" Cream w/Gold Streaks Plastic Salad Plates, 10ct.